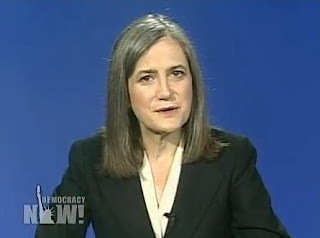 London/New York/Paris/Toronto/Athens/ 3mnewswire.org/October 3, 2008 — As the World Asscoation of Christian Communication (WACC) has issued in a news release WACC has announced that investigative journalist Amy Goodman, host of Democracy Now! (www.democracynow.org ), a daily TV /r adio news show airing on more than 700 stations worldwide, is to receive its Communication for Peace Award. The ceremony will take place at WACC´s international conference „Communication is peace“: Building viable communities and in Cape Town, South Africa, 6-10 October 2008 (Monday to Friday). Amy Goodman draws her inspiration from independent thinkers, artists, activists, journalists and alternative media around the world – those who challenge the powers that be. In Static, she writes: „Every day, Democracy Now! breaks the sound barrier by broadcasting a rich, dissenting, diverse range of voices. This includes the powerful and the grassroots, the banned, the celebrated, the despised, marginalized and ignored. These are the voices of people fighting to make the world a better, more humane, just, peaceful, and more compassionate place. Goodman holds a degree in anthropology from Harvard University and began her journalism career as producer of the evening news show for community radio station WBAI, Pacifica Radio´s station in New York City. In 1991, Goodman traveled to East Timor to report on the Indonesian occupation of that country. There, she and colleague Allan Nairn witnessed Indonesian soldiers gun down 270 East Timorese men, women and children during a memorial procession. Indonesian soldiers savagely beat both journalists, fracturing Nairn´s skull. Their documentary Massacre: The Story of East Timor later won numerous awards, including the Robert F. Kennedy Prize for International Reporting, the Alfred I. DuPont-Columbia Award, the Armstrong Award, and the Radio/Television News Directors Award. Goodman believes the role of the media is to go to where the silence is and say something. „I think the media can build bridges in society between cultures and communities. But we need to hear people speaking for themselves. That breaks down bigotry and the stereotypes that fuel hatred. If you don’t hear the voices of certain people, and you see them being demonized, it becomes easier to treat them as sub-human. In March 2004, Goodman obtained the international broadcast exclusive of the return of Haitian President Jean-Bertrand Aristide from his imposed exile in the Central African Republic to Jamaica, accompanying the Aristides with the delegation that retrieved them. Since 2006, Goodman has been writing a weekly column Breaking the Sound Barrier for King Features Syndicate. She says her column´s focus is to „include voices so often excluded, people whose views the media mostly ignore, issues they distort and even ridicule. co-authored with her brother, journalist David Goodman. WACC is proud to name Amy Goodman as the recipient of its Communication for Peace Award. Amy Goodman and two fellow producers of the Democracy Now! Team have got wrongful and unlawful arrested covering and gathering news about peace protests during the Republic National Convention. “It was shocking news to see how police officers which looked like they have prepared already for the battle of Armageddon (Greek Αρμαγεδδων; [armageddôn] also spelled Har-Magedon in some modern English translations; also known as Mount of Megiddo ) have mistreated one of the very best journalists and peace correspondents such as Amy Goodman from Democracy Now!.“, said journalist Andreas Klamm from IBS Independent Broadcasting Service Liberty. After about 60.000 people from around the world have signed several petitions to drop the charges against the journalist Amy Goodman and her two fellow producers have got released from prison and the charges have been dropped. Andreas Klamm is working as independent journalist, broadcasting host of 3mnewswire.org, XXL-info, Compact and many other radio and television programs. He is also the author of several books. In 1984 he has founded the independent news wire service 3mnewswire.org. In 1986 he became the founder and director of IBS Independent Broadcasting Service Liberty, Radio IBS Liberty, IBS Television Liberty. In 2006 he became the founder of the international media project “Human Rights Reporters” and has covered with his colleague Mr. Hans-Juergen Graf and other journalists about 150 cases of serious abuses of the human rights against poor people, believers in Christ and against journalists. After covering an event in memory of the victims of the NAZI-Terror-Regime during 1933 to 1945 in the year 2000 he and other co-producers have received threats and death threats for the television production “November 9, 1938 and today”. After he has completed as a soldier his entire forced 15 months military service from 1988 to 1989 with the German Air Force (not as a volunteer, but forced !) as a descendant of a Black-African French Army officer, Mr. Haedi Sabaot, he has requested the German military forces with a petition to accept his will that he wants not to fight as a soldier for the German military forces for religious, political and belief reasons. The German military forces have not accepted the petition. The journalist Andreas Klamm has published many articles in daily newspapers since 1984 which are accounted as “liberal” and some of them are accounted as “left wing media” while other media outlets and magazines are accounted as “christian” media. He is co-operating since 1986 with many journalists from around the world, some of them have expressed to be of the Jewish, Muslim or even Christian household of faith. 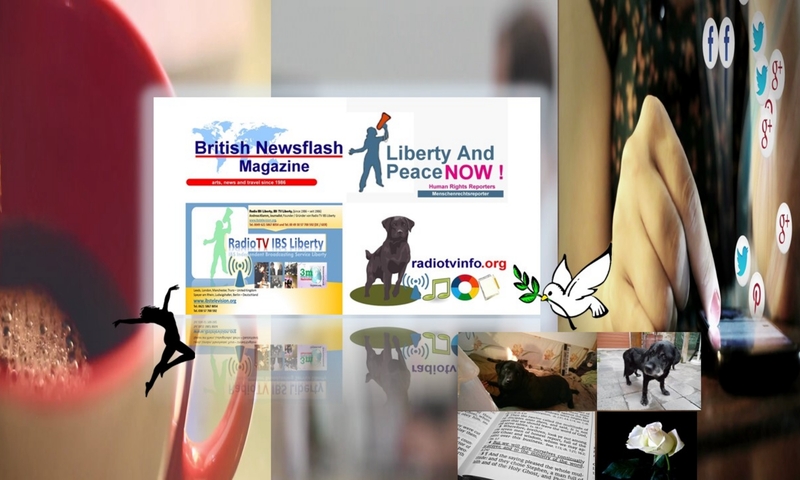 In 1986 he has founded the little independent magazine British Newsflash Magazine and in spring 2008 he became the co-founder of the international magazine MJB Mission News (ISSN 1999-8418). In October 2007 for reason of faith, religion, political issues and for many other reasons the journalist has requested with the U.S. Department of Justice in Washington D.C., according to article 15, universal declaration of the Human Rights, declared in December 1948 through the United Nations the official change of the German citizenship to the American citizenship, which he prefers. Observers from different countries have confirmed that the author and journalist Andreas Klamm suffers for about 19 months because of torture in Germany. Since about 19 months access to any kind of medical treatment, medical doctors and even dentist is denied. He wants to leave Germany and Europe, but somehow this request is also not granted at this moment. The journalist got disabled after three accidents in 1994, 1995 and 1996 and he needs medical treatment because of Asthma, back injuries and liver damages. After being diagnosed with possible cancer, which is not certain, in the year 2003 he has declared that he wants not to die in Germany and neither wants to be buried in Germany anymore. He himself treats not as a citizen of Germany anymore. “I am not certain if I am accounted in the United States of America, U.S.A., as an U.S citizen already, but I still have some hope to be able to live some years in the US and to take action as citizen of the United States of America, journalist, author, broadcasting host, independent television- radio and film producer for liberty, democracy and peace before I might have to pass away after about 19 months living without any kind of access to doctors or even dentists. However terrorists no matter in which masks they appear should try to understand and to learn, that they might be able to destroy some buildings and as a sad fact may even the life of people and investigative journalists, but you can not destroy the freedom, liberty, peace and spirit of so many precious people in the United States of America and even in other countries which are laboring hard for democracy, liberty and peace. It is not easy to handle every day the pain after a car accident in 1994 and after an accident while being performing some horse-back riding in 1995. Because of many research in concern of the United Nations declaration of the human rights, I do know that information, expression of thoughts, the freedom of the press and journalists and even medical and social security and freedom are important and elementary for a vital democracy. However I would be happy also if the U.S.A. would stop the terrible situation of torture against journalists which are disabled in Germany and which are working hard for democracy, liberty and peace, day and night by issuing as soon as possible the permission to live and work in the United States of America.”, said Andreas Klamm in concern of the email which he has received from an US-UN Public Affairs officer on October 23, 2007. In April 2007 the targeted killing of poor people with disabilities has taken place in Germany and has been continued after a public debate held by the German parliament in Berlin. Recently the author and journalist has declared “..that the war in Afghanistan is not a war in his name or in the name of the people in Germany. It is not a war in the name of all people in Germany. 20 million people in Germany do live beyond the poverty line and in poverty beyond description. Children, people with disabilities and even women have been starving to death in the country of Germany in 2007. Imagine if Germany would make the wise decision instead of building tanks for war to feed the poor citizen in Germany. This would have a great impact for peace, liberty, democracy and even social security. Most of these people do not want a war of any kind. People should try to learn that we are not competitors which are in a battle who is going to survive or not but that it is the duty of all human beings to understand and learn to live in peace and to support those which are in need instead to use weapons of mass destruction or to kill each other. The disasters which have taken place in this world such as the Tsunami in 2004 and all these earthquakes and hurricanes are already this worse, that political leaders should avoid to cause more disasters through war. My 2nd profession is to be a registered nurse (R.N., RGN) and from the experience when I became a nurse (R.N.) in 1993, also besides my 1st profession as a journalist I do know that it is certainly more difficult to save a life then to destroy a life. However I do believe together we can not only save one live but the life of many people and it is much better to save the life of people then to destroy the life of men, women and children in need. The ongoing wars in Afghanistan and in Iraq is the war of some people in high places and in power but not the war of the people of Germany and neither the war of the people of the United States of America. The people of the United States of America and of Germany are not the enemies of the people in Afghanistan or in Iraq, but those which are the war makers and which do profit from war. Every one which is able to think, should think and every one which is able to listen should listen. Many people want liberty, democracy, peace and not war ! The people in Iraq and Afghanistan should know that this is not the war of the people of the United States of America and it is not the war of the people of Germany.